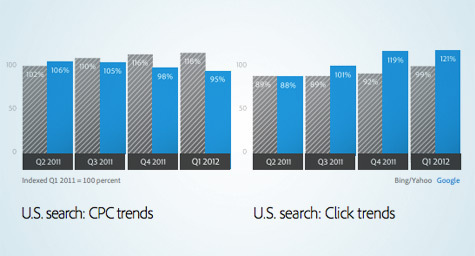 Three companies recently released reports that showed an increase in U.S. paid search spending during Q1 2012 and gave a glimpse into the future of paid search over the next year. Interestingly, each of their findings differed slightly, so SearchEngineLand.com reported on their individual insightful outlooks. In regard to U.S. paid search spending, the retail-focused Rimm Kaufman Group reported a 30 percent year-over-year rise, while the multi-dimensional Adobe’s Efficient Frontier found a 16 percent increase, and high-tech Covario saw a 15 percent jump. All three companies agreed that the cost-per-click (CPC) rates on Google declined, with Rimm Kaufman showing a 7 percent decrease and Efficient Frontier indicating a 5 percent drop year-over-year, while Covario reported a 3 percent fall from Q4 2011. In addition, Efficient Frontier showed that Yahoo/Bing CPCs rose by 18 percent year-over-year and Rimm Kaufman reported a 15 percent rise during that period. Efficient Frontier indicated that one of the largest trends in paid search was the increasing popularity of mobile devices such as tablets and smartphones. These digital devices accounted for 7.7 percent of the paid search spend in Q1, with the explosive growth of tablets leading to a higher spend than on smartphones. The shift toward tablets has been driven by the fact that they result in greater conversions than desktop devices, yet their CPCs remained slighly lower. By the end of 2012, company analysts predict that the overall mobile device spend will represent between 15 and 20 percent of paid search spending. Finally, all three companies cited that Google has remained the leading force in mobile traffic. In fact, Covario reported that Google had a 78 percent market share during Q1 and that their paid search spend was up 23 percent year-over-year. This is in sharp contrast to Yahoo/Bing with their much smaller market share and growth still down 20 percent year-over-year. Looking forward, Efficient Frontier predicted U.S. annualized growth between 10 and 15 percent, while Covario forecast global growth between 18 and 20 percent over the coming year. To leverage the power of paid search in your online advertising, contact MDG Advertising at 561-338-7797, or visit mdgadvertising.com.